Blockchain was created only for cryptocurrencies and to store their transactions alone. There there exist an uncertainty cryptocurrencies as lot of regulations made all over the world. So, we are not sure about whether the cryptocurrency concept will exist in future or not, but we are damn sure blockchain will be unavoidable for now and forever!! Wherever the data flood occurs, blockchain will come to rescue the system from drowning downwards. We have discussed the use case of Blockchain in different industry verticals such as banking,Insurance,Telecom, Healthcare , education and Supply Chain in previous articles. And now, We are going to discuss in detail about How Blockchain Can Be Used In CRM. As like other industry, integrating blockchain with CRM can make a lot of magical Changes, Let’s see what are they in detail below. CRM - It stands for Customer Relationship Management, The word alone explains the use of CRM, and who will use the CRM?. Yes CRM is used for business purpose only. Wherever a business deals with its customer, CRM will become the most useful system for such business. In CRM, a business can store the customer details as KYC, Status of Sales Pipelines, Prospect details, Sales opportunities, Reports, Email Automations, Lead Management and lot more details ! For any business, there will be a customer base, either it may be a big or low in volume. When there is a change in sales funnel, it should be properly updated, and should be transparent to everyone inside the organization. A CRM System can fulfill all the above. 3. Can track the customer interest and can identify in which point they are lagging to purchase a poduct from your company. 4. Customer interest can help us to identify the problems based on that a business can decide how to upgrade their products. 5. Easily to manage lead tracking system, so that the internal sales and marketing team can identify the lead status details. 6. Can generate Sales pipeline data reports. 7. Can identify the sales funnel strength. This would be explains the risks and challenges while maintaining the CRM for a organization. CRM is useful for both B2C and B2B business companies, As per the report of buyerzone, There were around 56% of Business to Business Companies have Used CRM in 2012. Apart from the collecting and tracking the customer details, Businesses faces some other changes while implementing CRM. CRM Is a tool that could help a business for improving the marketing strategies. CRM should be often optimized with changing marketing approaches. A lot of companies have fail to face proper results as they refuse to optimize their CRM solutions. A company which adopt CRM must change from production -oriented culture to customer - centric culture. We could easy do this with CRM softwares, but making the employee to diverge into different approach will be a challenge for a company. When implementing CRM for a business it requires significant time and training. Because making every departments and employees to understand the CRM workflow, and optimizing it across the organization will take a huge process for a company which is on good going. This kind of process could affect the company work flow and production flow. A company should decide in which IT framework or software the CRM Should be made and would fix the cost of purchase. After that the business should make a data house and server setups to manage the entire CRM solutions. If not, the data’s should be stored externally in third party solutions. Here the risk is the data’s are not secured . Cost and security creates a huge challenge here! Improving the service performance is often a complex task. CRM Improves the long term customer retention, which includes product they purchased and how they are interact with the company. Though the CRM extracts a lot of opportunities it is upon the business to properly utilize those opportunities. Setting up objectives in CRM is too important for an organization, so that the organization exactly track the benefits of CRM while measuring the goals achieved In ROI generation. It is must to form a CRM Team inside the organization. The team should cover up the people from top management, IT & Sales Department, Customer supports, Business Analyst and Senior executives. So that the organization can find out the daily issues and inefficiencies inside the CRM. There could be two types of deployment of CRM System, Whether it may be on premise or on-Cloud. The Team Of CRM should determine which type of deployment should be made, based on forecasting the issues. Deciding the cost is very important as it could drive a lot of expenditures. The entire setup could cover the total ownership cost, Resource Allocation, Hardware/ software integrations and etc. Integrating CRM with Other Systems Like ERP, HR Management Software and other sales software should be important during the implementation. Organization must decide which internal system have to be integrated with CRM Solution. 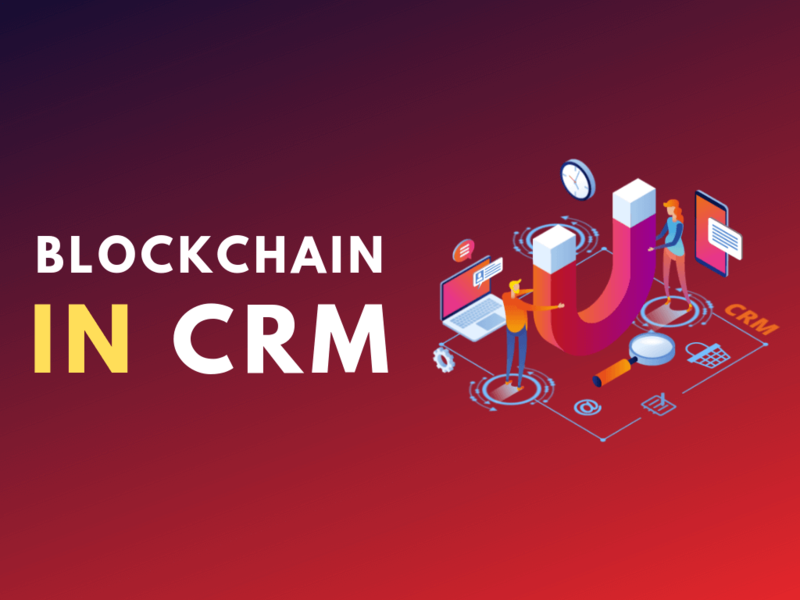 Let’s find out how blockchain can rescue the issues in CRM. As Blockchains are decentralized and are internally connected peer to peer system of blocks it become tough task tampering the entire blockchain. Keeping CRM Records in blockchain rather than cloud can give 100% security of processed records. Generally CRM system which keeps inside a cloud or on- premises are centralized, so only authorized people can access it. But bringing the entire data’s into blockchain can improve the transparency of records to the authorized people. Customer details, purchase and payment details are main source of a company, keeping this datas in side a tightly secured private blockchain can restrict third party people from accessing it. There may be a chance of duplicate or inaccurate information of transactions and customer details to occur if we neglect to keep the CRM solutions to be updated. But blockchain, eliminates the inefficiencies. Blockchain integration with CRM can improve the tracking of how a data has originated, transferred to other network, how the transaction has been closed, etc. Apart from the above benefits, blockchain will help an organization to revive from the above discussed business challenges, and implementation challenges Of CRM too. Read more for more references below here! How Blockchain Technology will be disrupting CRM for Good?